Howie Long co-starred in the 1995 action-adventure film, “Broken Arrow,” starring John Travolta and Christian Slater. In 1998, Howie Long starred in the motion picture, “Firestorm.” He also had a cameo appearance in the 1996 film, “That Thing You Do,” starring Tom Hanks. Howie Long was one of the best defensive linemen to play in the NFL. His size combined with his speed, strength and intensity made him unique. He tied the Raiders team record with eight Pro Bowl selections. He played his entire 13-year career for the Raiders after joining the team as a second-round draft choice in 1981. He became a starter in his second season and helped the Raiders to a Super Bowl XVIII win over the Washington Redskins by posting a career-best 13 sacks and registering five Super Bowl tackles. Howie Long was the last active Raider to have played for the team when it was based in Oakland. He was a member of the last AFC team to win the Super Bowl. He holds the Raiders record for the most sacks in a game (five), was named a defensive end on the NFL Team of the Eighties and was Seagrams Defensive Player of the Year in 1985. He was voted by fans as 1984 and 1986 Defensive Lineman of the Year and was named by the NFL Alumni Association as 1984 NFL Defensive Lineman of the Year. He also holds the AFC Pro Bowl record with nine and a half career sacks. As a defensive lineman at Villanova University, Howie Long was a four-year letterman in football. He was All-East and honorable mention All-American as a senior was named MVP in the 1980 Blue-Gray Game. He was also a champion boxer as an undergraduate and graduated from Villanova in 1981 with a degree in communications. Do you want to hire Howie Long? Directly request a quote. In 48 hours we can send you the availability of Howie Long If you would like to book Howie Long, Entertainment Booking Agency is the right place. 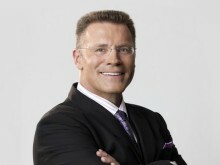 We will offer you the best price and contact the management or we directly contact Howie Long. For corporate appearances or speaking engagements you can contact our agents and the will help you true the process. Tags: hire Howie Long, Howie Long booking, book Howie Long, Howie Long appearances, find more information on booking Howie Long for appearances, Howie Long speaking engagements, Howie Long endorsements/spokesperson, Howie Long appearance fees, Howie Long booking agency contact info, biography of Howie Long, Contact an artist booking talent agent find a speakers bureau that can book Howie Long, speaker booking agency for Howie Long, Howie Long booking agency, Howie Long booking for corporate event. EBA is one of the biggest entertainment booking agencies in the World. We book hundreds of celebrities, artist, athletes and speakers in a year. Important to know is that we are not claiming to be the management of Howie Long. We are not the official agent for Howie Long. Companies from around the globe book these artists and speakers true our company be course we have one of the biggest networks and we always have direct contact with the artist or the management. We help you to find the right celebrities for your corporate of private events. Please contact one of our agents to get free advice and we will help to get the world-famous artist on your party.